When we forgive, it is not so much for the benefit of the offender as it is to release ourselves from the prison of anger, bitterness, and depression. Have you ever met this poor woman? Have you ever seen any other expression on her face than this one? Hard to deal with, isn’t it? No matter what you do, she’ll always spot the error, always bring it loudly to your attention, always be angry. The sad thing is, she doesn’t even know why she’s so unpleasant and hard to please. When I was working on my master’s degree, I did a year of practicum in a nursing home. I was a case worker, which meant that I had a regular list of residents that I looked after. Sometimes it was just a matter of going in and spending some time talking with them. There were other things to deal with, too, like family members who had questions or complaints; convincing a resident that she needed to stop ringing her bell every minute all night long; convincing them to eat, to tend to hygiene when they could, and so on. Well, good grief. This should a fun! He was stunned, speechless. After a few seconds, though, he got his second wind and started in on a tirade ranging from his childhood to his most recent meal. I gave him about ten minutes before I interrupted him. What he didn’t know was that I’d already informed all the appropriate people about my plans for Mr. Z, and they were all curious to see how it would go. He’d been terrorizing the caregivers for months, and they dreaded having to go into his room. I wasn’t worried at all. He had a positive story for me the next day. As time passed, we actually became friends. Finally, I was able to talk with him about spiritual things, and I suggested to him that he would be much happier if he would learn to forgive those who had hurt him over the years.He was astonished at the idea, believing sincerely that the only possible reaction to mistreatment was anger. The trouble with that, of course, is that the anger was eating him up from the inside, and it wasn’t affecting those he hated in any way. Anger itself is not sin. What we do in our anger is another story, and often the greatest sin we commit in anger is against our own hearts and spirits. Years ago, I read Tim LaHaye’s book How to Win over Depression. He wrote that offense leads to hurt and anger, leads to self-pity, leads to bitterness, leads to depression. The only way to break that progression is after the hurt/anger part, and the thing that breaks the chain is to choose to forgive. It is to realize that you yourself are far more hurt by your bitterness than is the person who hurt you. Even more important, your bitterness spills out like acid over all the other people in your life, who have no idea why your tongue is so sharp and your attitude is so critical. They don’t understand that you learned those behaviors as a defense against mistreatment. They only know you’re hard to deal with, and they try to avoid you when they can. “What will the householder do to the husbandmen?,” asked Jesus. Again, the priests and elders were caught on the horns of a dilemma. If they gave the correct answer, that would show that they completely understood the parable. If they lied, it would show them up for the scripturally ignorant men they were. Interestingly, they chose the correct answer. They said, “He will miserably destroy those wicked men!” I think they figured they’d come off better with the truth on this one. Of course, they still weren’t completely convinced that Jesus was Who He said He was, so they were willing to take a chance on being shown up yet again. The next thing Jesus said was based on Psalm 118:22-23, The builders were the religious leaders of national Israel. Jesus, of course, was the Stone that the builders were rejecting. Cast out of Israel, the vineyard, Jesus would become the Cornerstone of the Church that would spread the gospel to all nations, bringing the truth of salvation by grace through faith to all who would hear. And finally, those who refused the Cornerstone would be destroyed. What a dramatic prophecy, one that made the chief priests and elders grind their teeth in fury. But they were afraid to lay hands on Him, because the common people still looked on Him as a prophet. Next week, we’ll start Chapter 22, with another familiar parable, as Jesus sets the stage for accomplishing what He came to earth to do. In a final effort, the householder sent his son to the vineyard to gather the profits from the husbandmen. Surely, thought the father, they will respect my son and heir, and he will settle the problems there. Imagine the consternation and fury the elders and priest must have felt as Jesus uttered these words. The very Son that the Father had sent was standing in their midst. They had to understand what He was saying. How would they treat the Son? Will they receive Him and His message? No, not for a moment. Their desire to see Jesus destroyed must have hardened in that moment into the plans they made to trick Him, trap Him, accuse Him and kill Him; to take Him outside the city and destroy Him, and seize His inheritance. It is through His death, and resurrection, that we receive His inheritance, becoming joint-heirs with Jesus Christ (Rom. 8:17). That all would benefit by Jesus’ death was not in the plans of the chief priests, of course, but they did not know that they were part of the plan to bring salvation to a lost and dying world. They only knew that they had to destroy Christ before He destroyed their influence and power. Jesus made sure they knew that He knew their hearts and minds. He knew what they wanted. This is a more complicated parable, and still it keeps the religious leaders in place. This time, the parable reviews the history of their nation and predicts the calamity that will soon come to Israel. Later on, we’ll find that these men understood exactly what Jesus’ story was about. They must have figured it out pretty quickly, when Jesus spoke of the vineyard, the hedge and the winepress, the tower and the husbandmen, as well as of the fruit the vineyard was to yield. Israel, the nation to whom He had come to offer the Kingdom. Israel, a vineyard, is an Old Testament picture. The parable is founded upon Isaiah 5:1-7, Jeremiah 2:21, and Psalm 53:8. All these words had already been spoken to the prophets of old, and now He was come in the flesh to flash the truth of God’s mercy to Israel, their shameful past and the still greater sin in the hearts of these national leaders. The vineyard was not bearing fruit. The servants who came to the vineyard are the prophets sent by God, who had been rejected and mistreated. We’ll look at the rest of the story tomorrow. It is a heartbreaking picture of the hearts of men who have had every opportunity to thrive, and yet when they are held accountable, they fail to bear fruit. Let’s not be too quick to point the finger at unbelieving Israel. We’re no different. Our hearts easily grow cold and hard, and it often takes persecution to bring us to our knees in repentance for our unbelief. Jesus was still addressing the chief priests and elders when he told this parable. He had just refused to answer their question about His authority, because they would not answer His question about John’s baptism. He then went on to teach this parable, and I can only imagine the consternation, anger, frustration, malice, and deadly rage those haughty men must have felt as the Master spoke. Why didn’t they just walk away and leave Him standing there talking to Himself? They couldn’t! I believe that His authority was so compelling that they were literally unable to turn their backs on Him until He was finished with them. The story doesn’t need a great deal of interpretation. Jesus made the meaning and the application clear. These polished, cultured, educated religious priest and elders were far worse, far more obnoxious than the tax gatherers and harlots they despised, yet Jesus told them clearly that publicans and sinners would enter heaven ahead of them. Outrageous statement! Preposterous! The publicans and harlots are represented by the son who said he would not go, but then repented and went. The second, the liar, is not repentant. He represents the proud religious Pharisee, the high priests and elders. The root of their problem was unbelief. The next parable is even more inflammatory. Stay tuned. If you grew up in church and Sunday school, as I did, you probably memorized verse 12 along with the rest of what we have come to know as The Lord’s Prayer. Again, if you’re like me, you probably didn’t get stopped on one tiny little word until some years later. The word is as. We pray, “Forgive us as we forgive others.” We let the words role off our tongues so glibly that we don’t stop consider the importance of that one little word. Is that really what we want? That God forgives us in the exact same way in which we have–or have not–forgiven others? I don’t remember when I first “got it” about this principle. It’s been a very long time ago now, since I’ve reached this vast old age. Sadly, I didn’t get it when I was very young. I was an adult, rearing my own family, before the importance of this little word really sank into my heart. My experience had been that you don’t let anyone push you around, you fight back, you even the score. Standing up to those who would hurt you may be necessary and right, but if you don’t forgive those who hurt you, then all you’ve done is fight. You haven’t settled the issue. And you’re carrying around a load of anger and bitterness that will affect every other part of your life. This is so important that Jesus went on to say that the only way to GET forgiveness from God is to GIVE forgiveness to others. Those two verses, 14-15, have stirred up a firestorm of anger more than once as I work with people in my office who are struggling with deep hurts, abuse, misery, anger and depression. It is hard to realize that one’s relationship with the Father is tainted by unforgiveness; that indeed, if we do not forgive others, then He cannot forgive us! I urge you to ponder on these verses this week. 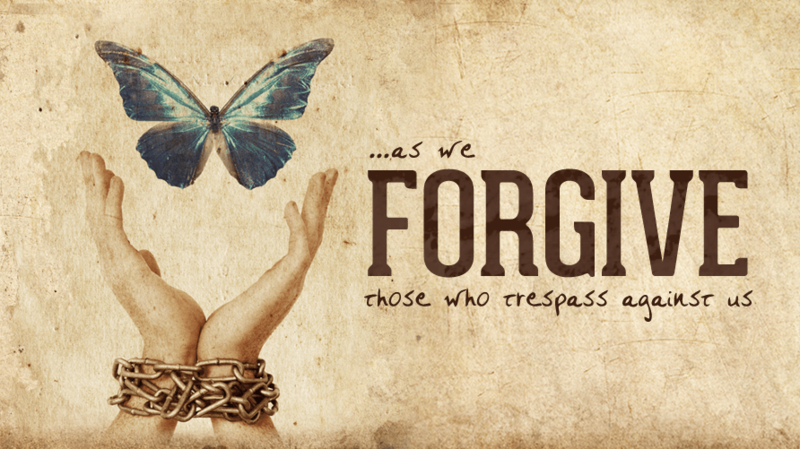 Next week, we’ll look at another important principle of forgiveness.